The winners of the 2016 Spirit of the Fringe award in Edinburgh are coming to Sadler’s Wells Peacock Theatre from May 1-19. The show has been described by the Sydney Morning Herald as “shamelessly entertaining,” and “mind-glowingly excellent” by the Australian Stage. 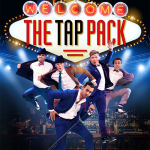 Inspired by the legendary Rat Pack, The Tap Pack are bringing an exhilarating new energy to a timeless style. With slick suits, sharp wit and songs from Sinatra to Ed Sheeran, Australia’s finest tap dancing performers are a cocktail of pure entertainment.